An archaeological dig is underway that could uncover a lost Bishop's palace. The dig in Ancrum in the Scottish Borders has long been believed to have been an important medieval site. "One of Glasgow's bishops - Bishop de Bondington who was responsible for building Glasgow Cathedral - actually died in the village after dictating his last writ to the Pope. "Ancrum, it seems, was at the very centre of medieval religion and politics until the Wars of Independence." A map from the 1770s depicts a ruined building on the site, but every map thereafter shows a blank field. Dr Bowles believes the ruins were most likely brought down around the turn of the 19th century to make way for agricultural improvement. 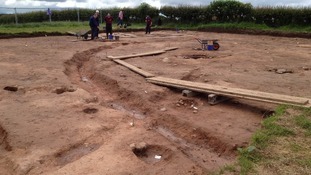 Archeologists digging for clues about life in Roman Maryport have discovered a new series of buildings on the site. An archeological investigation in the Lakes has uncovered a medieval Fulling Mill, it would have been used to prepare wool for tailoring.